Mr. R. D Tyagi, IPS (Retd), on June 15, 2018 presented his book Success Unlimited - Using Power of Subconscious Mind. This book contains basic principles of success, which if followed can propel any person to great heights of success. This book will guide you to think bigger, aim higher, get motivated and accomplish unlimited success. This book is a key for those who thrive to success. The book, Success Unlimited - Using Power of Subconscious Mind, highlights the importance of spiritual power and a gateway to purify one’s thoughts and consciousness. It comprehensively defines success and parameters of success. In the absence of the spiritual base, purity of thoughts and feelings and values - the success tends to sustain for short span of time. Mr. Tyagi has shared his personal life experiences in the book, Success Unlimited - Using Power of Subconscious Mind. While sharing more about the book he said that, the various principles towards success have been experienced by me and I thought of sharing my experiences with the youth of our country. This was the major reason, which motivated me to pen down all my thoughts on this topic. Mr. Tyagi also mentions that, “The success principles and ideas given in the book are inspired by the thoughts of Dr. D Y Patil." The launch of the book was hosted by Dr. D. Y. Patil, former Governor of Tripura, Bihar and West Bengal. He is also the founder of D. Y. Patil deemed universities. Shri. Mohan Bhagwat, chief of RSS has stated that, "The language in the book is simple and easy and Mr. Tyagi's narrative directly hits at the principles which he has experienced to create milestones and lead a successful life. 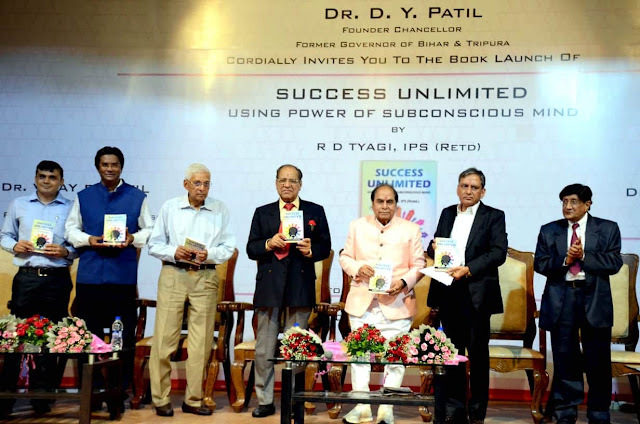 The book, Success Unlimited - Using Power of Subconscious Mind, is totally devoid of any attempt to project the name and personality of Shri R D Tyagi as an individual. The book shows you the path to not only be successful in life but also to lead a meaningful life." Mr. Tyagi has taken to spirituality and meditation after his retirement and has published various books such as Happiness Unlimited, Yoga – The way to Divine Bliss etc. for the betterment of mankind. The present book of success is also written based on his personal experience in the life and the practice of spirituality. About the Author: Mr. Tyagi joined ONFC after completing his post graduation in Physics. He joined Indian Army in 1962 as an Emergency Commissioned Officer and participated in Indo-Pak war of 1964-65, wherein he was awarded Raksha Medal and Samar Seva Starfor his services in the operations. He served the Indian Army for five and half years and therafter joined the IPS and spent 32 years in the Indian Police. He worked as Commissioner of Police, Greater Mumbai and Retired as Director General, National Security Guard (Black Cat Commandos), New Delhi. Mr. Tyagi was one of the most effective and successful Police Officers of the Maharashtra Cadre.